Western blot analysis of extracts from HeLa cells, transfected with 100 nM SignalSilence® Control siRNA (Fluorescein Conjugate) #6201 (-) or SignalSilence® Bim siRNA I #6461 or SignalSilence® Bim siRNA II (+), using Bim (C34C5) Rabbit mAb #2933 and α-Tubulin (11H10) Rabbit mAb #2125. 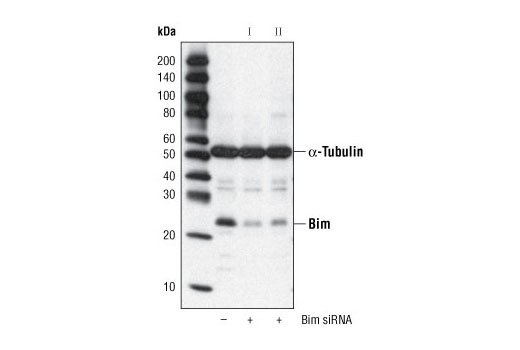 Bim (C34C5) Rabbit mAb confirms silencing of Bim expression and α-Tubulin (11H10) Rabbit mAb is used to control for loading and specificity of Bim siRNA. CST recommends transfection with 100 nM Bim siRNA II 48 to 72 hours prior to cell lysis. For transfection procedure, follow protocol provided by the transfection reagent manufacturer. Please feel free to contact CST with any questions on use. Each vial contains the equivalent of 100 transfections, which corresponds to a final siRNA concentration of 100 nM per transfection in a 24-well plate with a total volume of 300 μl per well. SignalSilence® siRNA is supplied in RNAse-free water. Aliquot and store at -20ºC. SignalSilence® Bim siRNA II from Cell Signaling Technology (CST) allows the researcher to specifically inhibit Bim expression using RNA interference, a method whereby gene expression can be selectively silenced through the delivery of double stranded RNA molecules into the cell. All SignalSilence® siRNA products from CST are rigorously tested in-house and have been shown to reduce protein expression by western analysis. Bim/Bod is a pro-apoptotic protein belonging to the BH3-only group of Bcl-2 family members including Bad, Bid, Bik, Hrk, and Noxa that contain a BH3 domain but lack other conserved BH1 or BH2 domains (1,2). Bim induces apoptosis by binding to and antagonizing anti-apoptotic members of the Bcl-2 family. Interactions have been observed with Bcl-2, Bcl-xL, Mcl-1, Bcl-w, Bfl-1, and BHRF-1 (1,2). Bim functions in regulating apoptosis associated with thymocyte negative selection and following growth factor withdrawal, during which Bim expression is elevated (3-6). Three major isoforms of Bim are generated by alternative splicing: BimEL, BimL, and BimS (1). The shortest form, BimS, is the most cytotoxic and is generally only transiently expressed during apoptosis. The BimEL and BimL isoforms may be sequestered to the dynein motor complex through an interaction with the dynein light chain and released from this complex during apoptosis (7). Apoptotic activity of these longer isoforms may be regulated by phosphorylation (8,9). Environmental stress triggers Bim phosphorylation by JNK and results in its dissociation from the dynein complex and increased apoptotic activity. O'Connor, L. et al. (1998) EMBO J 17, 384-95. Hsu, S.Y. et al. (1998) Mol Endocrinol 12, 1432-40. Bouillet, P. et al. (2002) Nature 415, 922-6. Whitfield, J. et al. (2001) Neuron 29, 629-43. Dijkers, P.F. et al. (2000) Curr Biol 10, 1201-4. Ley, R. et al. (2003) J Biol Chem 278, 18811-6. Puthalakath, H. et al. (1999) Mol Cell 3, 287-96. Lei, K. and Davis, R.J. (2003) Proc Natl Acad Sci U S A 100, 2432-7. Putcha, G.V. et al. (2003) Neuron 38, 899-914. SignalSilence is a registered trademark of Cell Signaling Technology, Inc.
Limited Use Label License, RNA interference: This product is licensed under European Patent 1144623 and foreign equivalents from Ribopharma AG, Kulmbach, Germany and is provided only for use in non-commercial research specifically excluding use (a) in drug discovery or drug development, including target identification or target validation, by or on behalf of a commercial entity, (b) for contract research or commercial screening services, (c) for the production or manufacture of siRNA-related products for sale, or (d) for the generation of commercial databases for sale to Third Parties. Information about licenses for these and other commercial uses is available from Ribopharma AG, Fritz-Hornschuch-Str. 9, D-95326 Kulmbach, Germany. Custom Ordering Details: Product is assembled upon order. Please allow up to three business days for your product to be processed.